When you look at your baby, what’s the first thing to come to mind? Is it “precious little miracle?” Is it “tiny bundle of joy?” Or is it “ruthless subaquatic murder machine? !” If that last one seems like a stretch to you, then it’s not your fault. Your imagination just needs a little help getting there! Our Infant Shark Bunting turns even the most innocent, harmless, and cutest babies into the terrifying apex predators nature intended them to be. This supremely cozy one-piece is perfect for baby’s day out whether they’re going trick-or-treating, fishing, or to the aquarium. 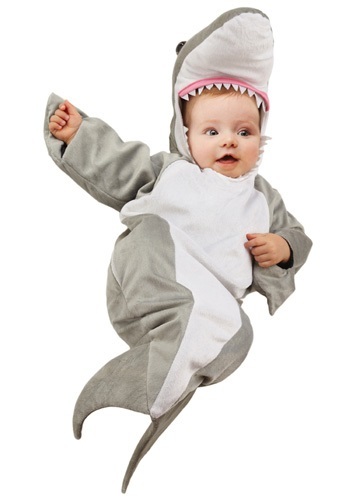 The slots in the fins let your baby keep using their incredibly precious little baby hands, just like a real shark. Now is one of the very few times when it’s perfectly acceptable to wish your infant was inside of a carnivorous fish!